Predaceous ladybird beetles are known to consume alternative foods from flowers, especially when prey is scarce. Flower-rich semi-natural habitats in agroecosystems generally host a diversity of natural enemies, including predaceous ladybird beetles, suggesting that the availability of flowers may have a positive role in their fitness traits. In this study, we test whether feeding on flowers of Perilla frutescens (Lamiaceae) increases longevity and fecundity in Harmonia axyridis Pallas (Coleoptera: Coccinellidae). The longevity of H. axyridis females and males fed with five flowers was significantly greater than those fed with one flower and in the control group (no food), although the provision of flowers had no positive effect on the increase of body weight in males and females. 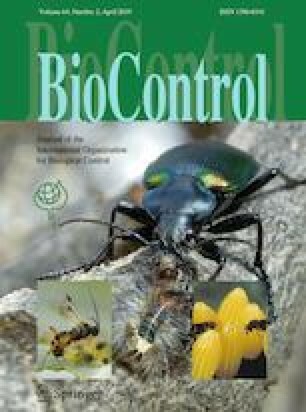 The number of eggs and oviposition frequency in H. axyridis fed with flowers plus prey, as well as with prey only, were significantly larger than those fed with only flowers, whereas no significant difference was observed between individuals fed with the mixed diet and those with only prey. However, on the first day of the diet assignment, the number of eggs from individuals with the mixed diet was significantly higher than of those with only prey and those with only flowers. The results show that flowers of P. frutescens, mixed with prey, have a positive effect on H. axyridis survival and early reproduction, suggesting that flowers may play an important role in increasing fitness in H. axyridis. The possibility of P. frutescens sown in fields to support populations of the predator toward conservation biological control is discussed. This research has been co-funded by the University of Liège, Belgium and the European Union (Marie-Curie Belgium International PostDoc-COFUND), Wallonie Bruxelles International (WBI.World), Postdoctoral Fellowship for Research in Japan to S. Hatt (No. P18396), and a Grant-in-Aid for Scientific Research to N. Osawa (No. 18F18396) from the Japan Society for the Promotion of Science. Thanks are also due to Agrisect, Tsukuba, Japan for obtaining pupae of Harmonia axyridis and the JA Federation of Economic Organizations of Aichi, Japan for supplying flowers of Perilla frutescens used in preliminary experiments.